emperumAn, analysing what this AzhwAr wanted, took the responsibility on himself to give what he wanted, came along with pirAtti to where he was present and started jostling him. emperumAn, unable to hear what this AzhwAr was telling his divine mind “have you known emperumAn as he is?”, came to where the AzhwAr was. paNbALA – Oh one who is simple! ninRAyAl – did you not shower your mercy by standing! nIyum thirumagaLum ninRAyAl – even if pirAtti were to complain about your followers to you [emperumAn], you would reply, as mentioned by periyAzhwAr in periyAzhwAr thirumozhi 4-9-2, “en adiyAr adhu seyyAr” (my follower will not do that). Even for those who knowingly indulge in wrongful deeds, pirAtti would plead on their behalf, as mentioned in SrI rAmAyaNam yudhdha kANdam 116-45 “nakaSchinnAparAdhyathi” (there is none who has not committed a wrongful deed). Such pirAtti and you. 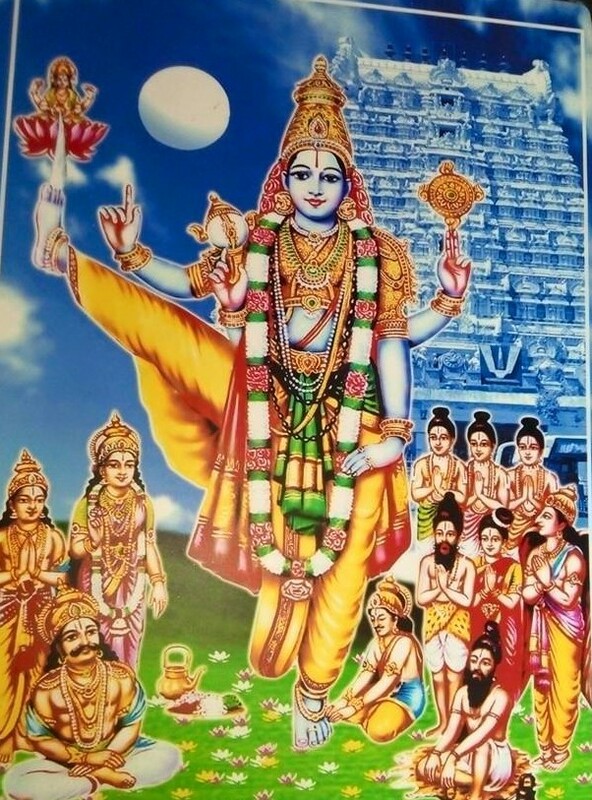 Did you not set out to the forest only to protect your followers, making it as a solemn vow, as mentioned in SrI rAmAyaNam ayOdhyA kANdam 31-2 “rAgavancha mahAvratham” (it was the great vow by rAghava [another name for SrI rAma])! At that time, did sIthAppirAtti not say as in SrI rAmAyaNam yudhdha kANdam 27-6 “agrathas thE gamishyAmi” (I am going ahead of you) in order to protect the followers! ninRAyAl – this could be construed in any of three ways: 1. emperumAn came on his own [to where AzhwAr was present]; 2. emperumAn’s mercy is causeless; 3. After emperumAn joined with the (three) AzhwArs, he felt at peace. kunRu eduththup pAyum pani maRuththa paNbALA – Oh the epitome of simplicity, who took a hill to block the rain which was battering the cowherds! Just as he lifted the mountain even before it started raining, to protect the cows and cowherds from their suffering, emperumAn mingled with the AzhwArs and removed his own suffering. Has it not been said in SrI rAmAyaNam bAlakANdam 1-28 “guhEna sahithO rAma: lakshmanEna cha sIthayA” (only after joining with guhan, SrI rAma felt that he had joined with lakshmaNa and sIthA)! vAsal kadai kazhiyA uL pugA – neither leaving the corridor for the outside nor entering the corridor to go inside. Just as those who are in love wish to stay within the vision of their loved ones, emperumAn also stayed in the corridor where the three AzhwArs were standing. It appeared to him that there was wildfire on both sides of the corridor! [on the outer side of the corridor were the people who were interested only in worldly pursuits and on the inner side was the rishi (sage) who tried to reach emperumAn through other means [devotion] instead of directly approaching emperumAn). SrI rAma said in SrI rAmAyaNam ayOdhyA kANdam 97-8 “yadhvinA bharatham thvAm SathrugnanchApi mAnadha, bhavEnmama sukam kinchith bhasma thath kuruthAm SikI”(let fire burn to ashes the comfort of leaving bharatha, you [lakshmaNa] and Sathrugna). While the pAsuram initially talked of both emperumAn and pirAtti (nIyum thirumagaLum) here the reference is only to emperumAn. This is because pirAtti is like the shadow of emperumAn; hence there is no need to refer separately to the shadow! kAmar pUm kOval idai kazhiyE paRRi ini – this could be construed as either emperumAn is dwelling now at the corridor, at the desirous , beautiful thirukkOvalUr or he will henceforth dwell like this. The word ini refers to getting something which had been lost since the beginning. nammAzhwAr has also mercifully said in thiruvAimozhi 2-7-3 “ini ippARpattadhu yAdhavangaLum sErkodEn” (henceforth I will not allow any faults to come)! emperumAn did not come to thirukkOvalUr to rid the effect of his karma! It was to prevent samsAris such as ourselves (dwellers of this materialistic realm) from going to hell to experience the effect of our karma! Isn’t thirukkOvalUr the dhivyadhESam (divine abode of emperumAn) which sowed the seed for emperumAn showering mayarvaRa madhinalam (granting of knowledge and devotion) on all AzhwArs! We shall consider pAsuram 87 next. This entry was posted in thiruvAimozhi, thiruvAimozhi 5th centum on September 4, 2017 by T N Krishnan.